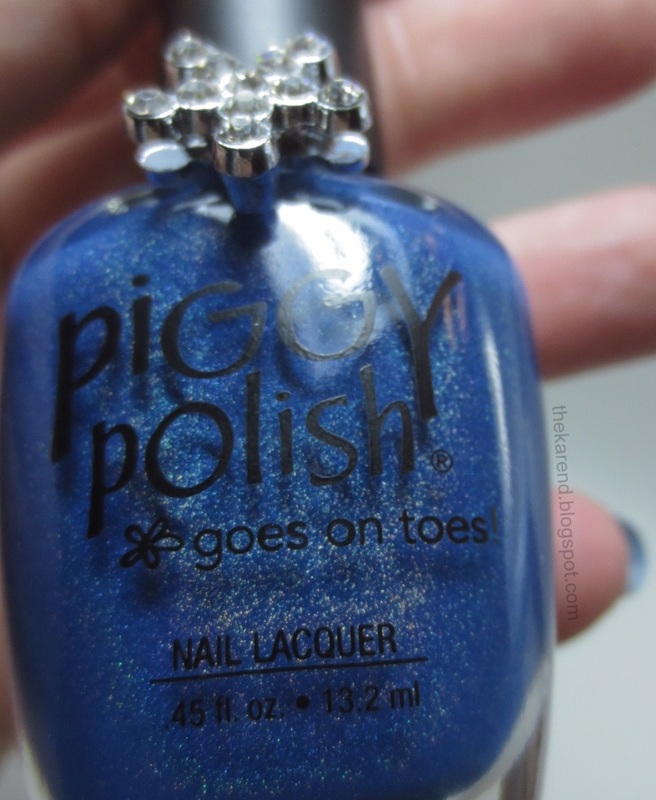 When I saw the Piggy Polish displays at Rite Aid (as shared in my most recent display post), I bought the one color I was most intrigued by, a blue shimmer called Vincent's Stars. It wasn't easy to tell in the fluorescent lighting of the store, but the shimmer looked like it might be holographic. In better light at home, I did indeed see hints of a rainbow in the bottle. 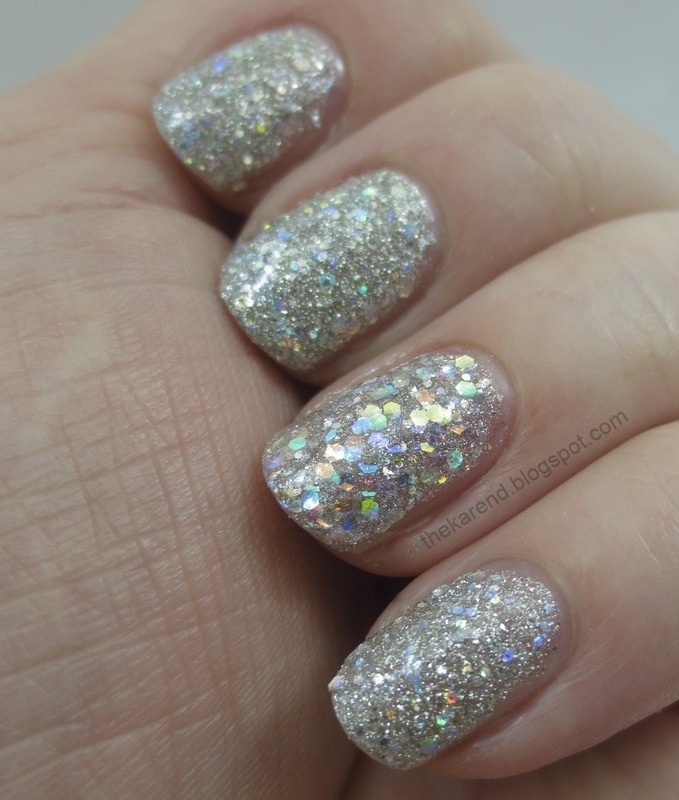 On my nails, I saw no holo, at least not in the indirect light of my lightbox. The polish was well behaved; my swatch is 2 coats over regular base coat (I think I used OPI in this case). Even without topcoat, it's plenty shiny. The rhinestone star ring that came with it is a bonus; maybe I should try wearing it when sandal weather finally arrives, though I've never gone for toe rings before. I thought maybe the holo would show in more direct light, so I pulled my hand out of the lightbox and held it at various angles. Nope, not really any holo evident. Maybe a few tiny points of color showing, but maybe that's wishful thinking on my part. Okay, fine, let's go out in the sun. Surely if there's holo to see, it'll show up there. Turns out the only rainbows I saw in the sun were in the bottle. 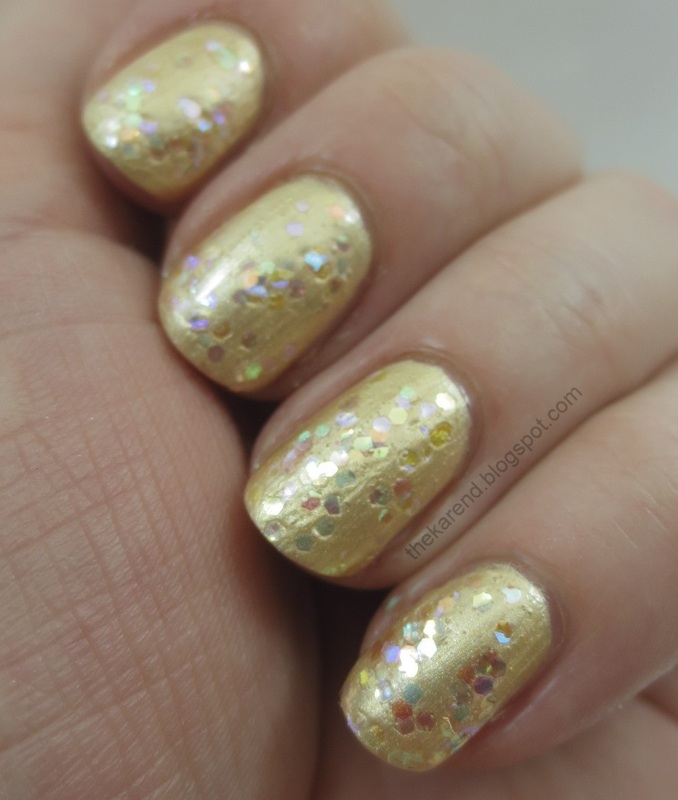 On my nails, no matter how I turned them this way and that, I saw only the very tiniest hints of color sparking off the shimmer, and that only on some nails at some angles. The holo is weak in this one, for sure. I can forgive that, since the display wasn't advertising it as holo, and it didn't have a premium price tag compared to other Piggy Polish colors. It's just a bit disappointing since I thought I might have found a gem in the drugstore with this one. I do like the color, regardless, so I'm not kicking it out of my stash. Once again, Nail Wheel Wednesday is being preempted by swatches of more current polishes. In addition to the Awaken collection I shared yesterday, Zoya also released three new PixieDust shades for Spring 2014, collectively known as the Magical Pixie collection. They kindly sent bottles of these for review as well. Shade names are Lux, Cosmo, and Vega. Compared to the PixieDust polishes we've seen before, these are chunkier, with some medium and large glitters in them, and more colorful due to some of those glitters being holographic/color shifting ones. Cosmo is silver with holographic accents. I used two coats for my swatch. 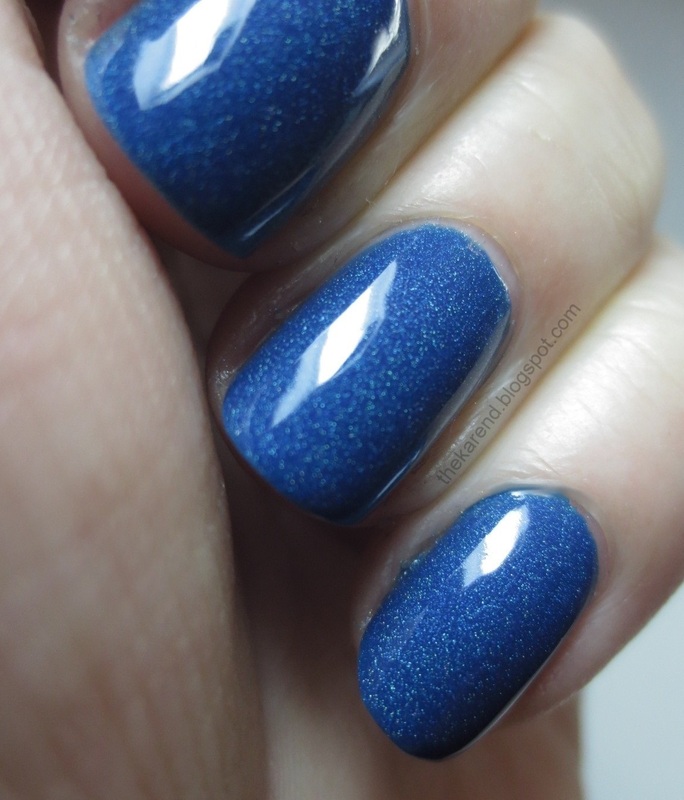 It dried to a rougher texture than the previously released PixieDust polishes, which was not surprising given the larger glitters it has added to the finer ones. The colors sparking off the holo glitter made me think of the shifting hues of Monet, so I added two coats of that to my ring finger for an accent before adding topcoat to all my nails. I liked Cosmo shiny and smooth like this, and really liked the added oomph Monet gave while still letting the silver base show through. 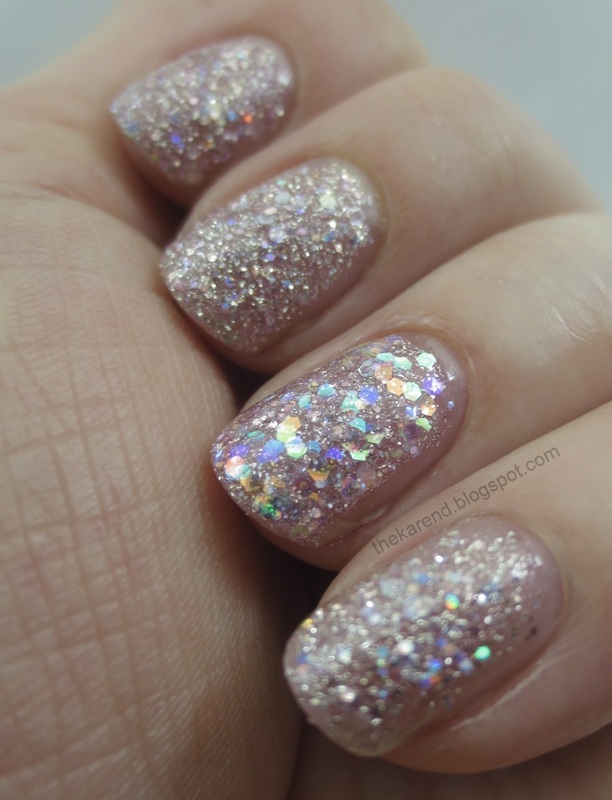 Lux is a dusty rose with the same holo accent glitters as Cosmo. This shade blends in with my skintone, making it almost a "mannequin hands" look, if mannequins had textured sparkly nails. Like with Cosmo, my swatch is two coats. I gave Lux the Monet accent nail and topcoat treatment, too. Vega is the sky blue sibling in this set of triplets. 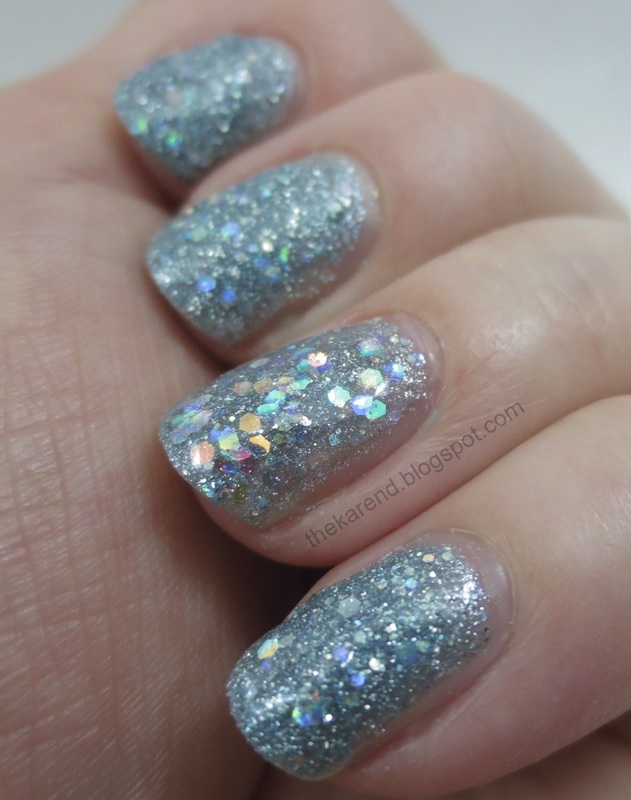 Same texure, same holo glitters, same two coats for the swatch. Monet accent and topcoat looked good over Vega as well. 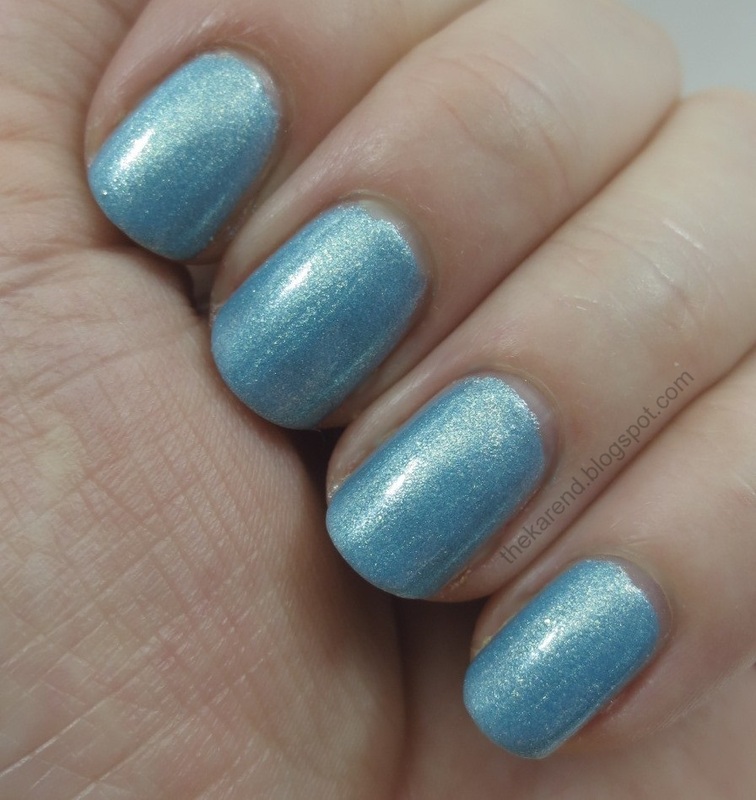 If I hadn't been pressed for time during this swatching session (as for most sessions), I would have tried a mani with a Magical Pixie color topped with Monet, leaving just the accent nail at two coats of the Pixie Dust alone. 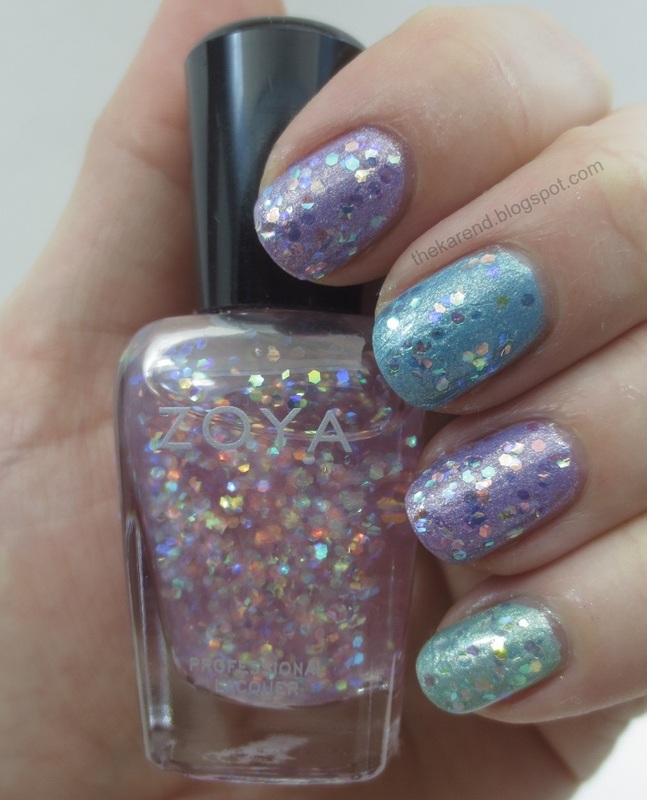 Much as I like these Magical Pixies, I hope Zoya's future releases include more of the fine-grained PixieDust polishes, as those are my favorite texures to wear on their own. I'd like a periwinkle one and a teal green, for sure. 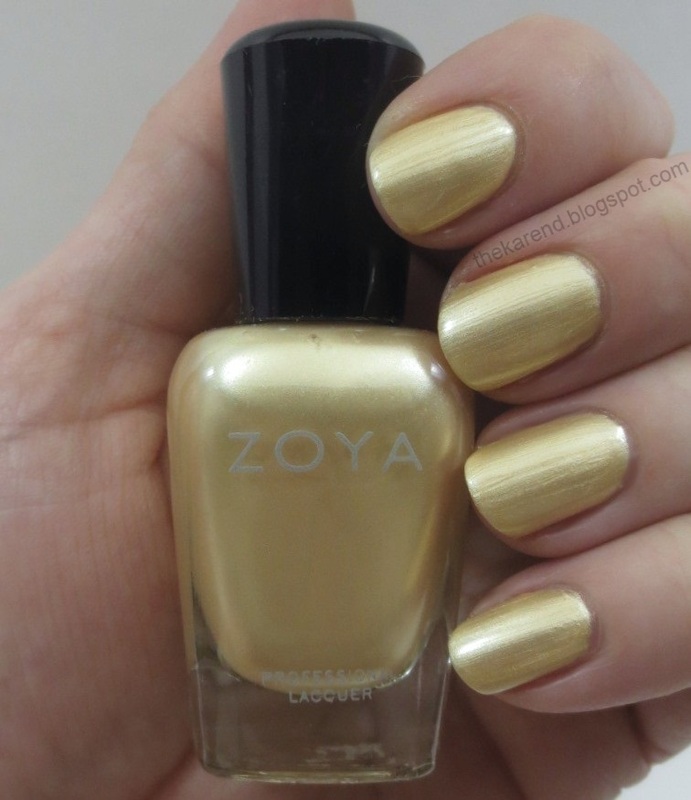 After a teaser of warmer weather here in southeast Michigan in recent days, there was snow on the ground this morning, so I am in extra need of looking at pretty colors like the ones that Zoya has released for Spring 2014. They sent their Awaken collection and coordinated special effect topper for review. Left to right: Dot, Cole, Brooklyn, Dillon, Rebel, Hudson, Monet. There are two cremes in the collection. 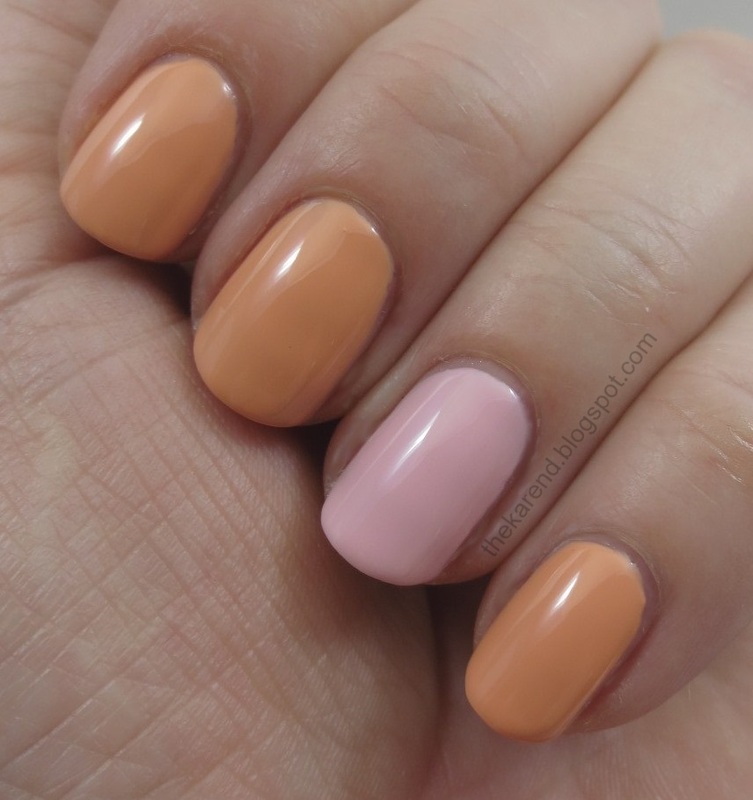 Cole is a soft pastel orange and Dot is a pastel pink. I used three coats of each for my swatch. 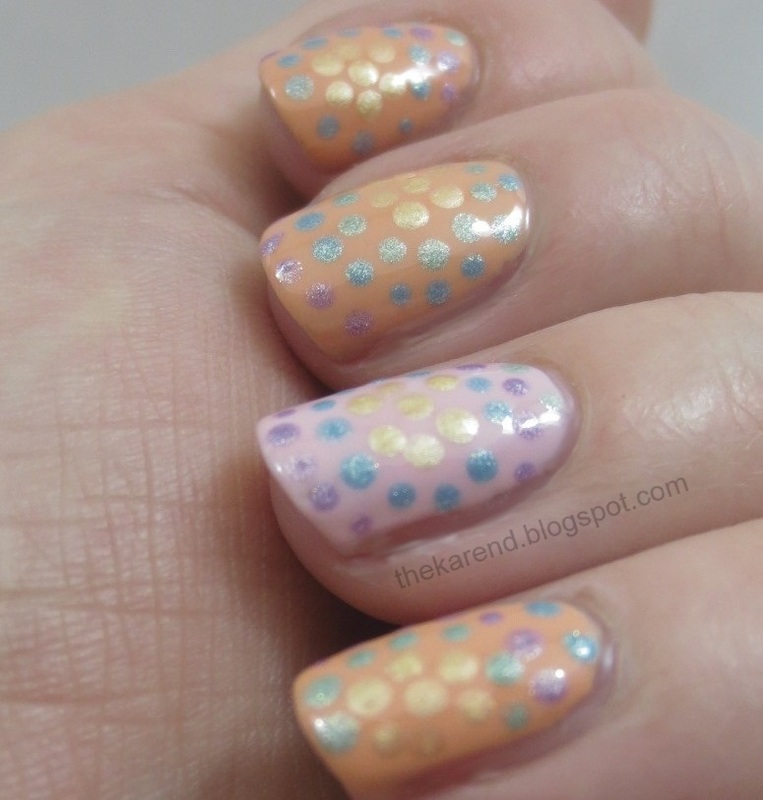 The other four colors in Awaken are shimmers; before I swatched them on their own, I decided to use them for a dotticure over the cremes, using a design I'd pinned from Paulina's Passions for my inspiration. My version fell short of what I'd hoped to create, in part because I didn't actually look at Paulina's post before I started but instead worked from memory, which was more vague than I thought. Next time, I'll aim to make my dots closer together so the concentric rings of color stand out more. I distracted myself from my not so successful nail art by turning, as I so often to, to glitter. 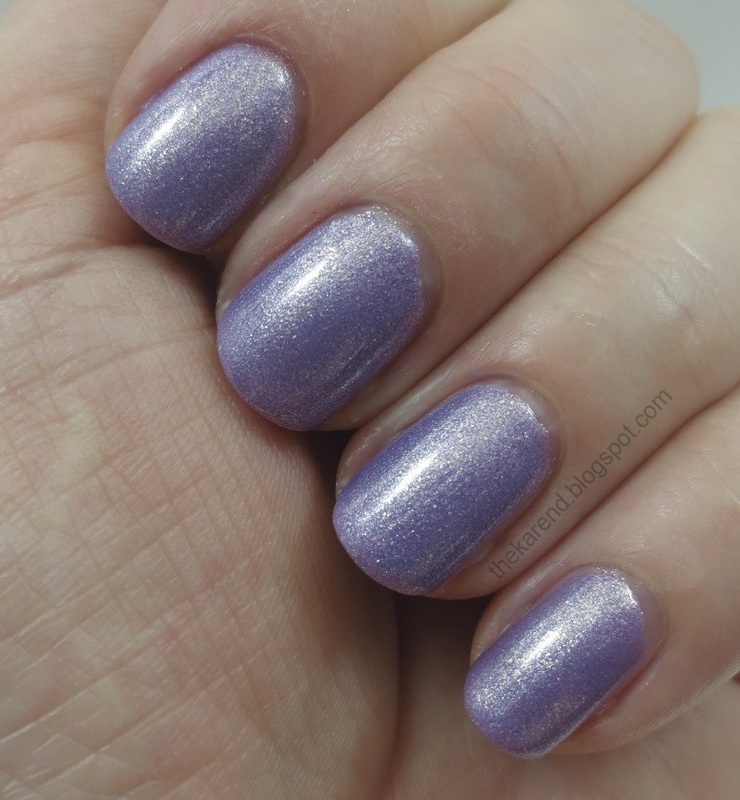 Monet has color shifting transluscent medium hex glitters in a very sheer purpley pink base. I alternated Cole and Dot on my nails then added two coats of Monet plus topcoat. The base of Monet is on the thick side; I didn't have too much trouble applying it but did get a few bubbles. Thinning it might be a good idea. I quite liked the effect, though, with the glitter showing slightly different colors over the different bases but still coordinating really well and pulling together the whole look. Brooklyn is a pastel golden yellow shimmer with definite frosty tendencies. I used two coats for my swatch. I wasn't that crazy about Brooklyn on its own but thought adding a couple coats of Monet plus topcoat might improve things. I did like it better with the glitter (but did not like the bubbles I saw forming in the Monet layers due to the thick formula). The last three colors in Awaken are all flecked shimmers similar to some of the colors in the Zoya Surf collection from 2012 or Lovely from last year. I liked that finish, and I liked these three as well. Rebel is sky blue; Dillon is mint green, and Hudson is lilac. Rather than trying Monet over Rebel, Dillon, and Hudson individually, I did almost-Skittles with them and then added Monet. 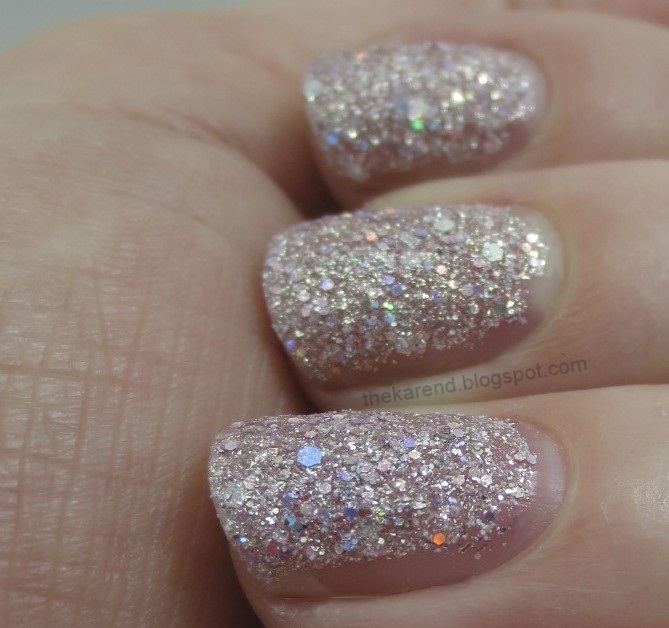 The result is what I'd call a perfect spring manicure—all my favorite colors plus glitter, all looking soft and pretty. I didn't even notice any bubbles in Monet, whether due to the flecked shimmer hiding them or because I'd gotten better at applying the thick formula at this point I don't know. Obviously the Monet and the cool-toned shimmers are my favorites. Monet reminds me a lot of Lilacquer Bohr-ing, which is long since discontinued (though the Lilacquer had a better formula). Cole and Dot are fine cremes, very well behaved for pastels; I just don't find them as interesting as the flecked shimmers. I think Brooklyn is skippable; Piaf from last year's Lovely collection is not the same color but it doesn't show any brushstrokes and would fit the bill of a soft golden shimmer (see comparison of those two plus other Zoyas on The Silver Nail). Yes, yet again I am overdue for a display post. The alphabetical by brand approach I used last time worked well for me, not just in getting the post written but also when I went back to look for a particular display later (to see if I'd already posted it so there wouldn't be any duplicates this time), I'm sticking with that approach. We'll kick things off with a brand I've not run into before: Bonita. 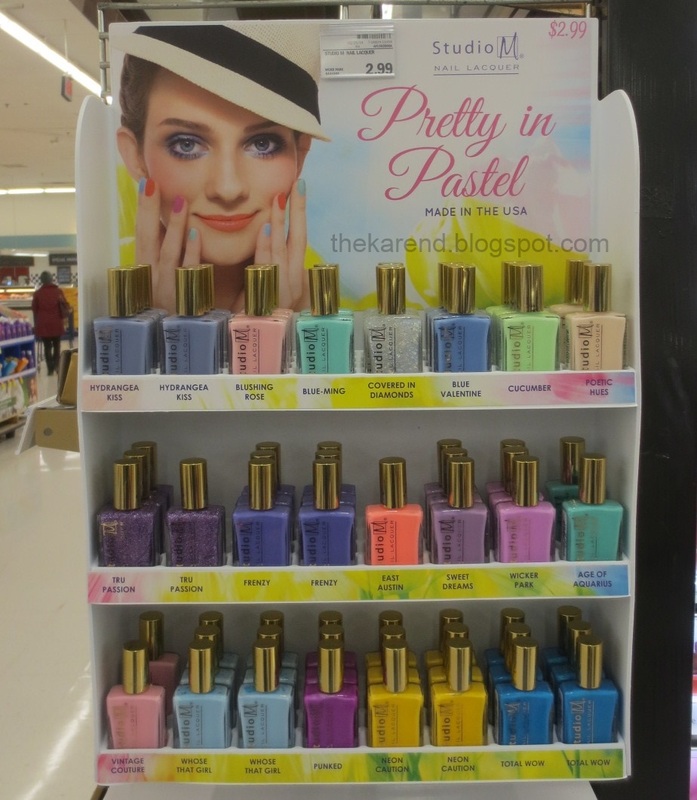 One of my Rite Aid stores had a display of eight bright colors: Blue Steel, Glitzy Heels, Pear Me Up, Team Pink, Royal Highness, Orange You Happy, Peonies Gone Wild, and Ride the Waves. I think all of these were shimmers, but they were so tightly wedged into the display slots that I only picked up a couple colors for a closer look. 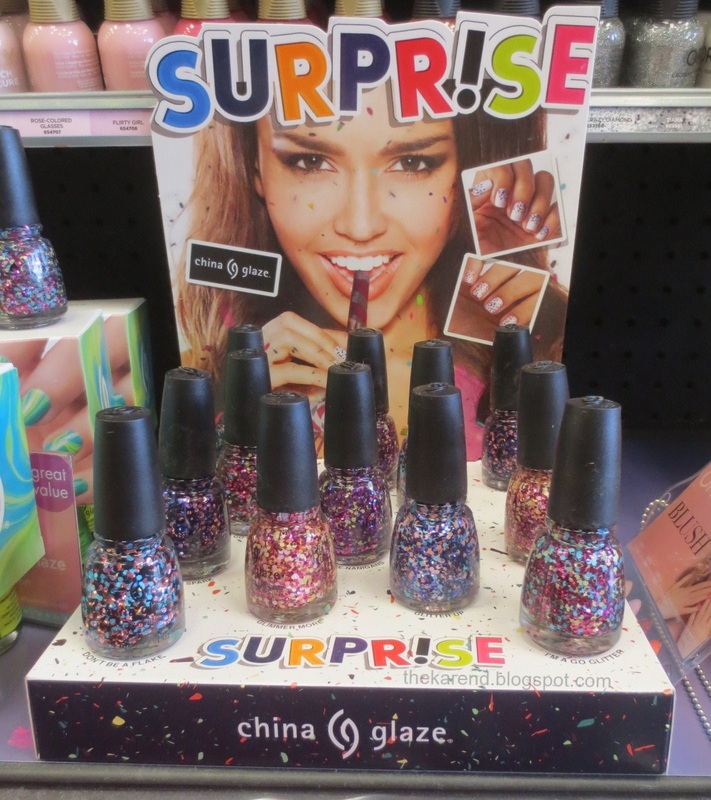 At Sally Beauty, I saw China Glaze Surprise, which is a collection of six chunky glitter toppers. There's Don't Be a Flake (black/sky blue/rose), Glimmer More (peach/pink/yellow), Glitter Up (blue/sky blue/peach), I'm a Go Glitter (hot pink/lime/sky blue), Create a Spark (black/blue violet/copper), and Shine-nanigans (hot pink/lime/blue violet). 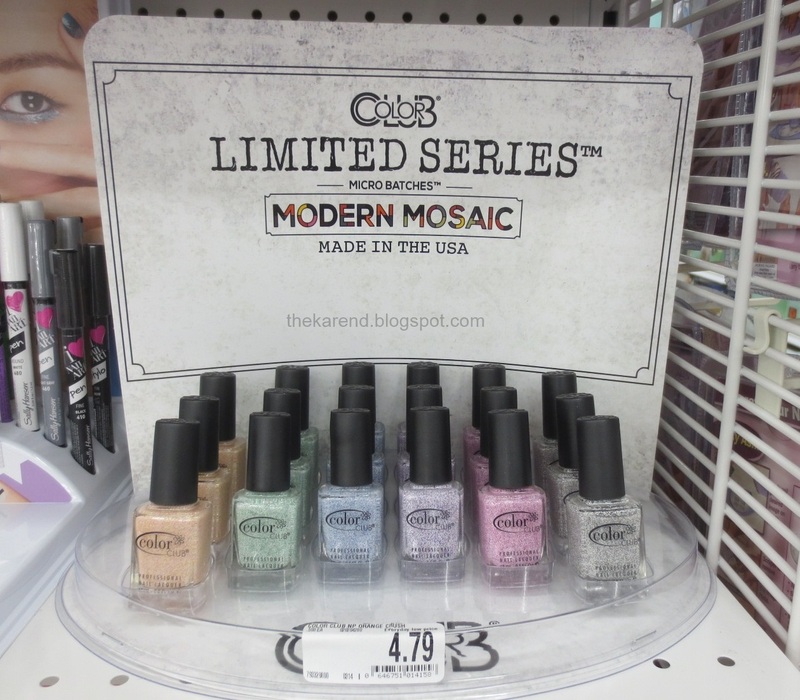 At one of the Bed Bath & Beyond stores with a health & beauty section, I saw Color Club Modern Mosaic. This was labeled "Limited Series" and "Micro Batches", which I guess means grab 'em when you see 'em. 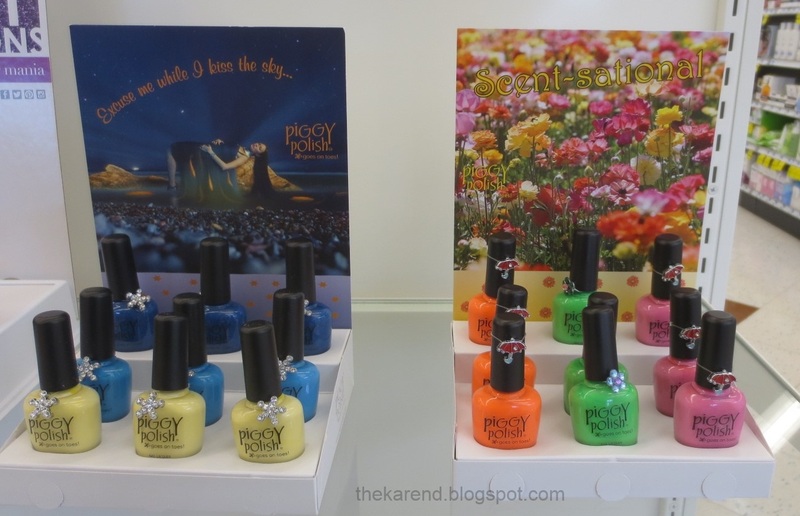 There are six shades here: Orange Crush, Green Piece, Blue Beaded, Love You to Pieces, Pixi-lated, and Subway Station. When I first looked at these I thought they were matte microglitters, but the particles are actually round, like beads. 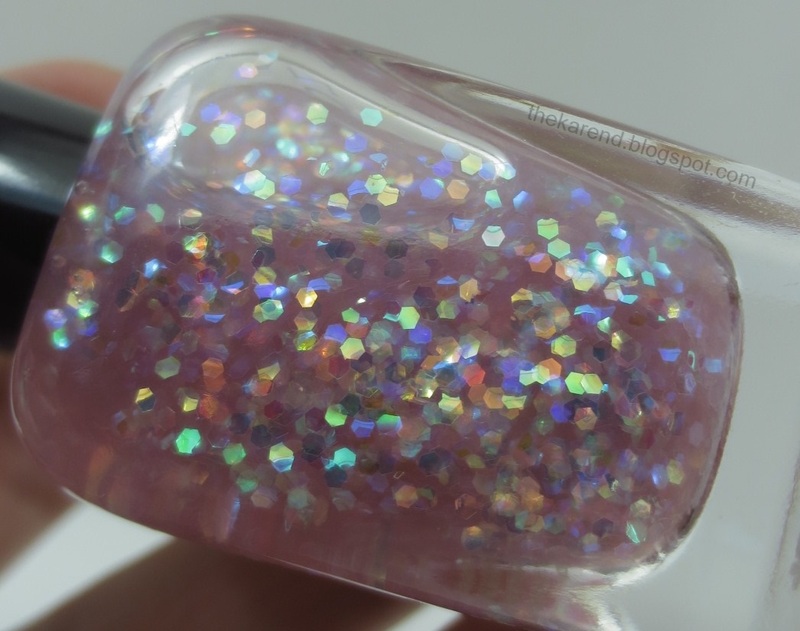 Maybe this is what textured polishes look like when they're made with a clear base? When I was out in Idaho at the end of last month, I was able to stop at a Fred Meyer, where I saw two Essence displays that haven't shown up yet in my part of Michigan (and if past history is any indication, they won't ever). 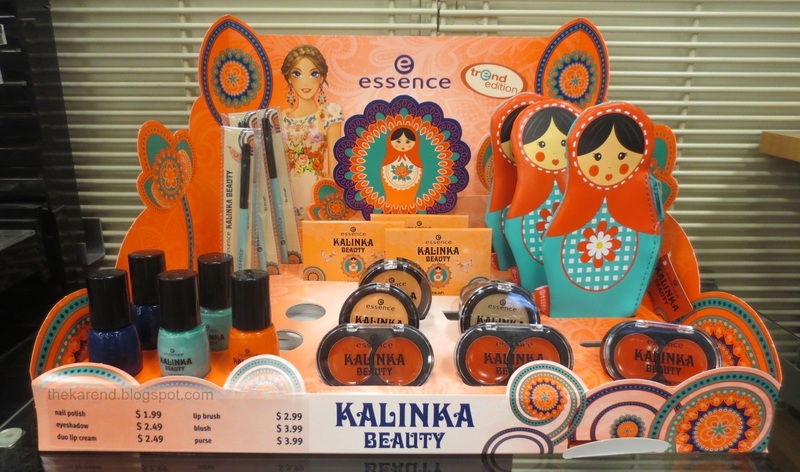 The first was Kalinka Beauty, which has three creme polishes: Absolut Blue, Green Scene, and East Side Story. 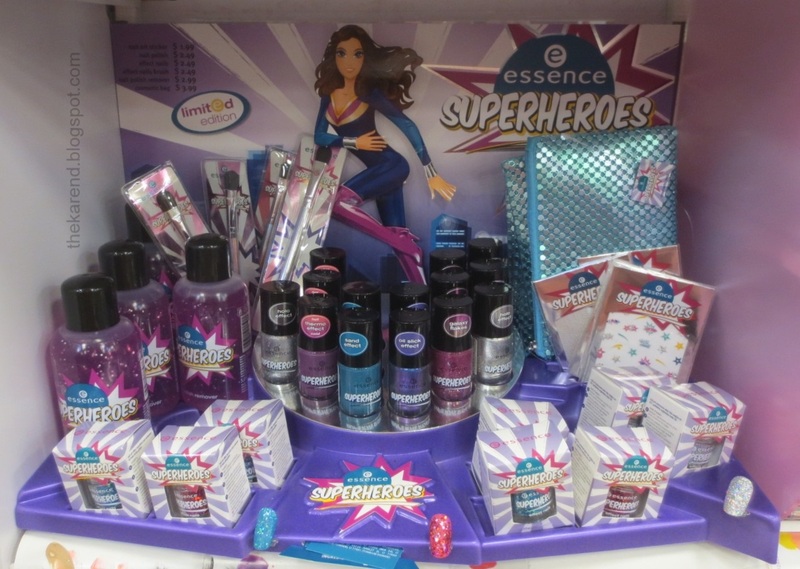 The other Essence display I saw was Superheroes, which was packed with nail stuff: remover with what looked like glitter in it, pots of loose glitter in three colors, brushes to sweep off excess loose glitter, decals, and five polishes (there were slots for six but for some reason Essence never seems to want to send full collections over here). The polishes are Super Man (silver holo micro glitter), Fantastic Girl (warm purple thermo), The Incredible (turquoise texture), Power Girl (purple duochrome), and The Awesome (pink with glitter mix). 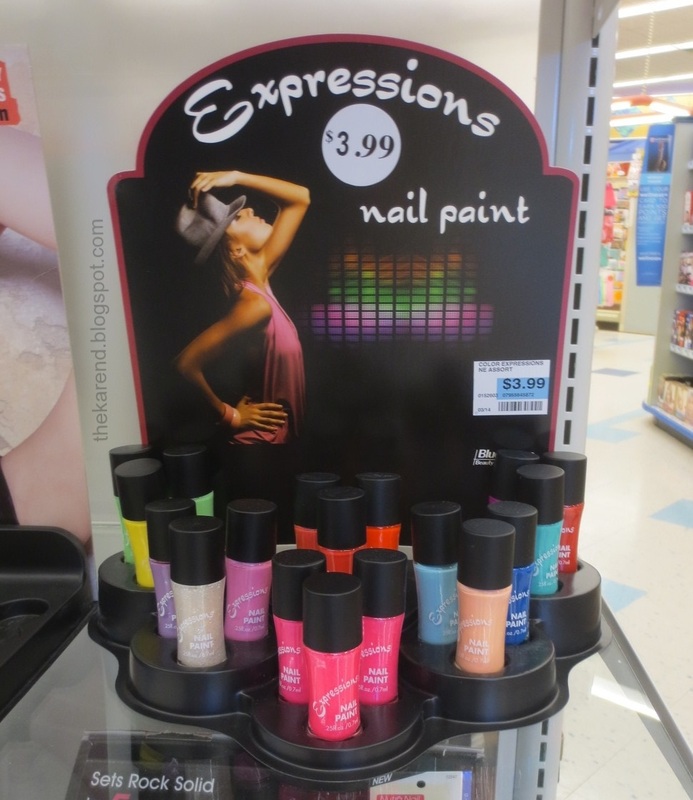 A couple different Rite Aid stores I've been to recently had displays of Expressions Nail Paint. The bottles look just like the ones that Blue Cross Mood Struck colors came in, so I wasn't surprised to pick these up and find the Blue Cross name in fine print on the back (and no shade names anywhere). Sally Beauty has two seasonal collections of Finger Paints out now. The first are the Shredded Chromes, a group of five metallic glitters (possibly textured, though it doesn't say and I haven't tried them or even looked up swatches): Stargazing Lilac, Gilded Chrome, Stardust Blush, Metallic Moondust, and Crystalline Crush. 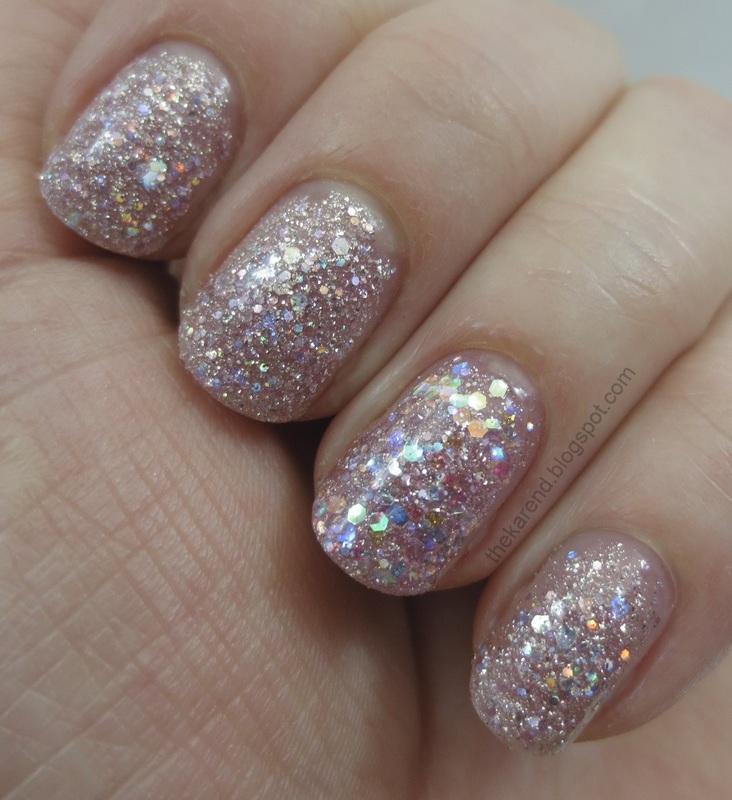 The second Finger Paints collection is Pastel Rain, which has thre pairs of colors, each with a fine glitter and a creme. The spring greens are Shower with Flowers and Mistful Thinking. The pinks are A Pink of Pixie and Springtime Bloom. The blues are Crystal Springs and Dream I Can Fly. Rite Aid had LA Girl Feather Frenzy, which is eight shades of bar glitter polishes with bird names: Crane, Oriole, Flamingo, Peacock, Hummingbird, Parrot, Canary, and Raven. 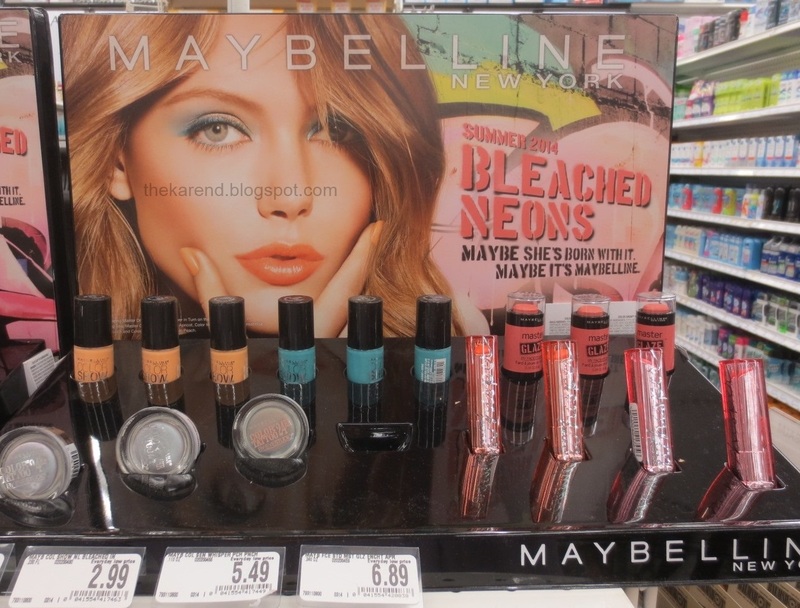 The latest offering from Maybelline is Bleached Neons for Summer 2014 (summer! when it's just very barely spring here). The polish display I saw at Bed Bath & Beyond had five colors: Pink Punch, Lime Accent, Coral Heat, Citrus Collide, and Ultra Violet. 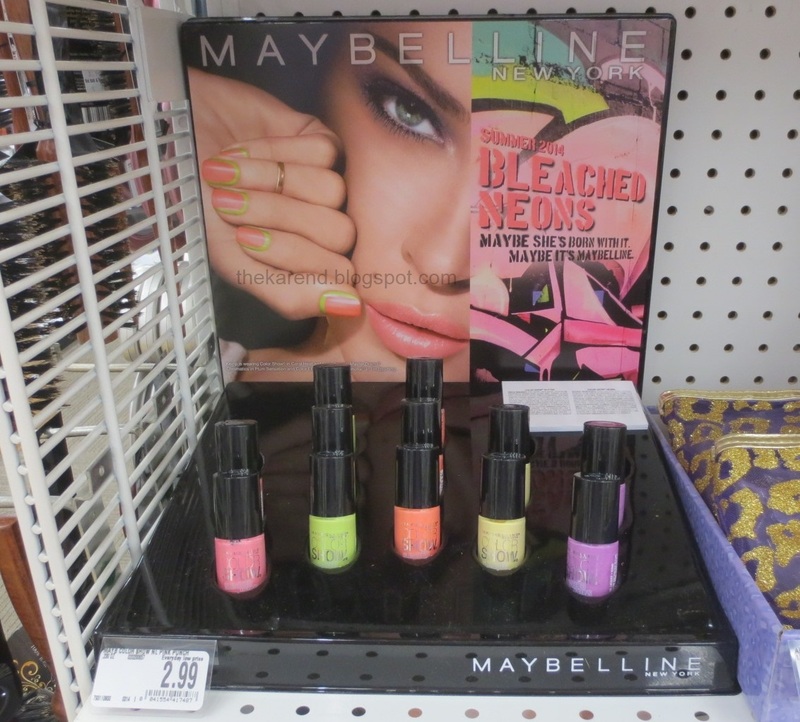 There was also another Maybelline Bleached Neons display with two more polishes nestled in among the other makeup: Bleached in Peach and Day Glow Teal. Also at Bed Bath & Beyond, I saw a Nicole by OPI display with what I expected to be the second group of colors from the collection (the ones I swatched back in February). Most of them were there, but two were not. This had Party Bus, Love My Pups, Color Me Country, Some Hearts, and Sing You Like a Bee from the second set and Carrie'd Away which was also in the first displays we saw back in February. I'm not sure when the two remaining colors, American as Apple Pie and Fisher Queen, will show up. I also spotted this display at Meijer and it was the same lineup of colors (not surprising, since the names are printed right on the display). 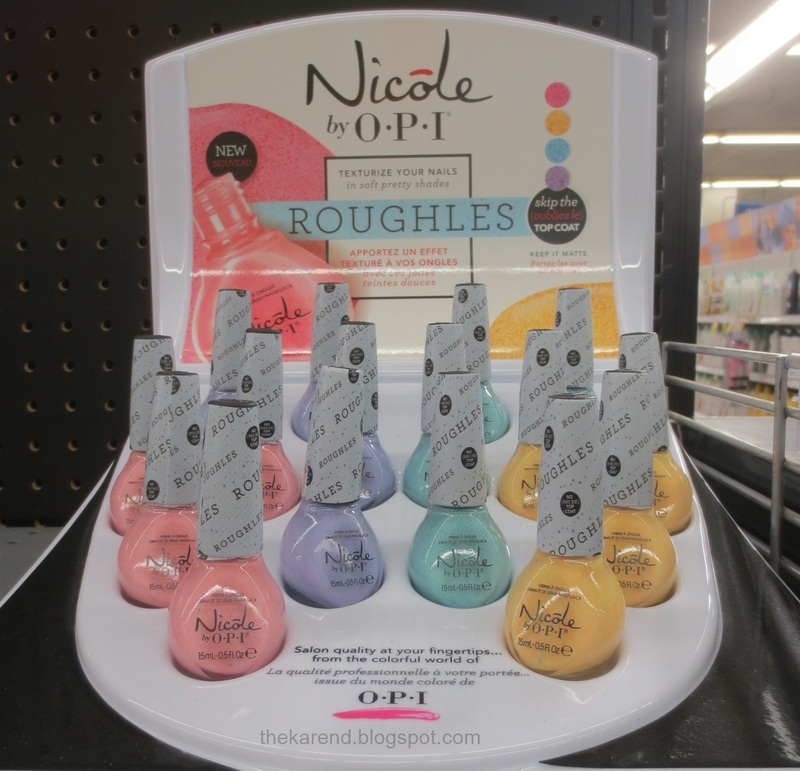 Nicole by OPI has also released Rougles, which are pastel textured polishes. Unlike the Gumdrops textures, these are not glittery. Shades are: Rock the Look, I'm Stucco on You, On What Grounds, and Sand in My Shoe. I saw these first at Meijer but have since seen at CVS. 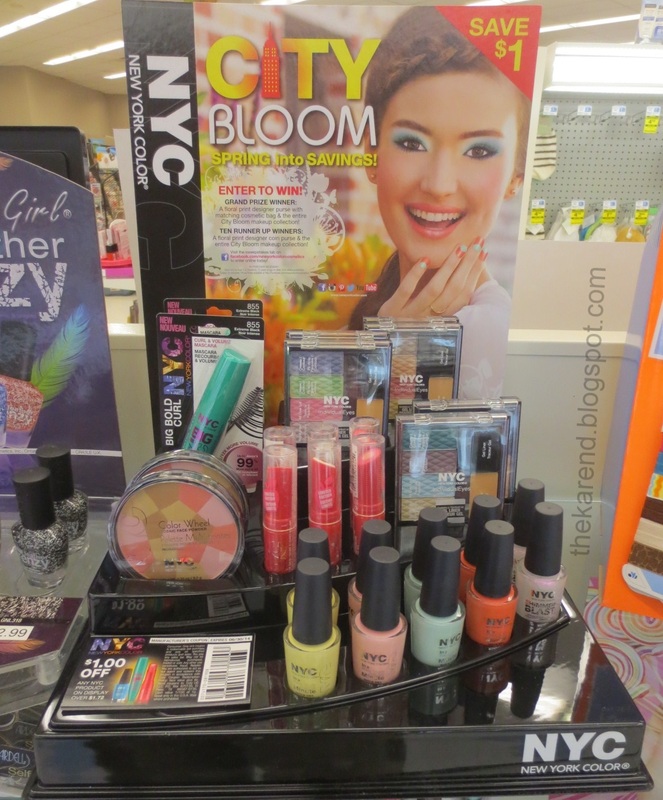 The spring collection from NYC New York Color is City Bloom. There are five polishes here among the rest of the makeup: Mimosa Bouquet, Sunset Park Pink, Robin's Egg Blue, Coral Crush, and Sweet Candy. The first four are cremes; the last is a shimmery sparkle top coat to use over them. 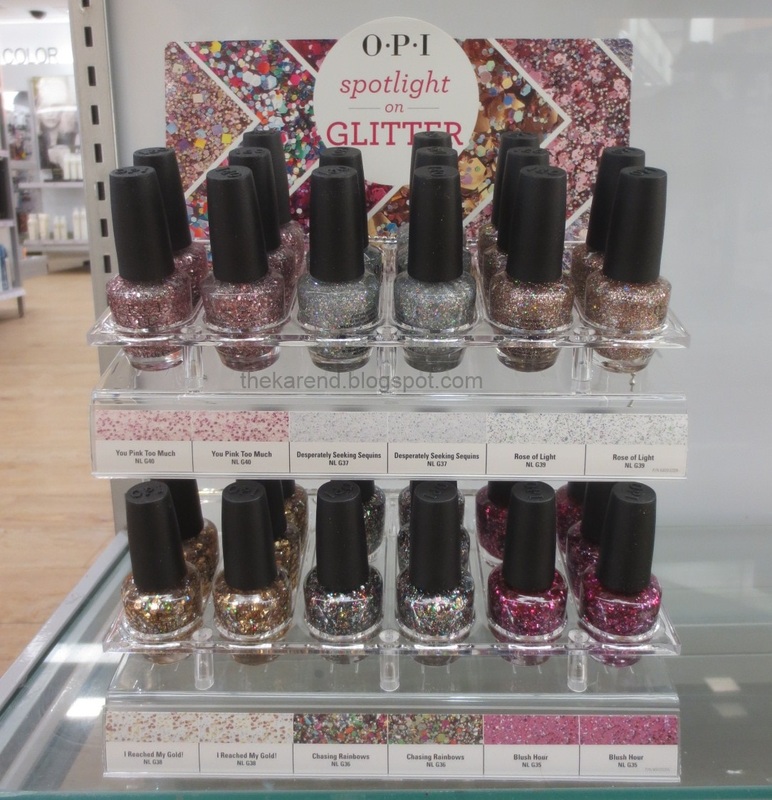 The OPI Spotlight on Glitter collection showed up at my Ulta. This has six shades: You Pink Too Much, Desperately Seeking Sequins, Rose of Light, I Reached My Gold, Chasing Rainbows, and Blush Hour. 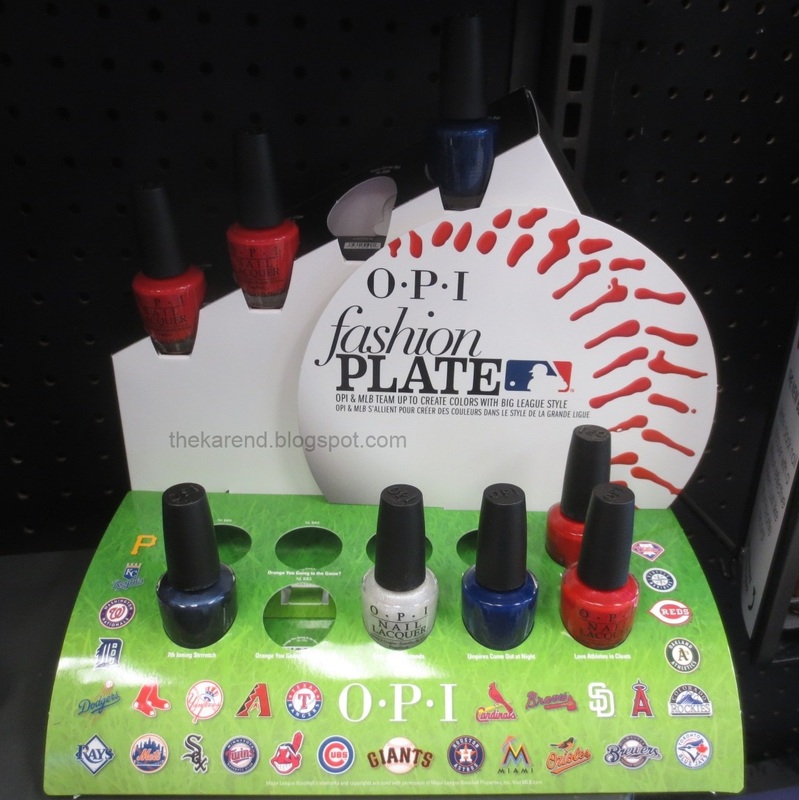 Sally Beauty had OPI Fashion Plate, a tie-in with Major League Baseball. Seven colors here: 7th Inning Stretch, Orange You Going to the Game (sold out before I got there), Girls Love Diamonds, Umpires Come Out at Night, Love Athletes in Cleats, Short-stop, and Right off the Bat. I was very surprised to walk into one of my Rite Aids and see Piggy Polish. I've only ever seen it at Ulta before, but here were two full displays at Rite Aid. On the left, there's Excuse Me While I Kiss the Sky, which has Yellow There, Be Blue-tiful, and Vincent's Stars. On the right, Scent-sational has Sun Scents, It's Bouquet, and Makes Sense. The first set didn't look familiar to me, but the second set was at Ulta last summer in a display called Engage Your Scent-ses. 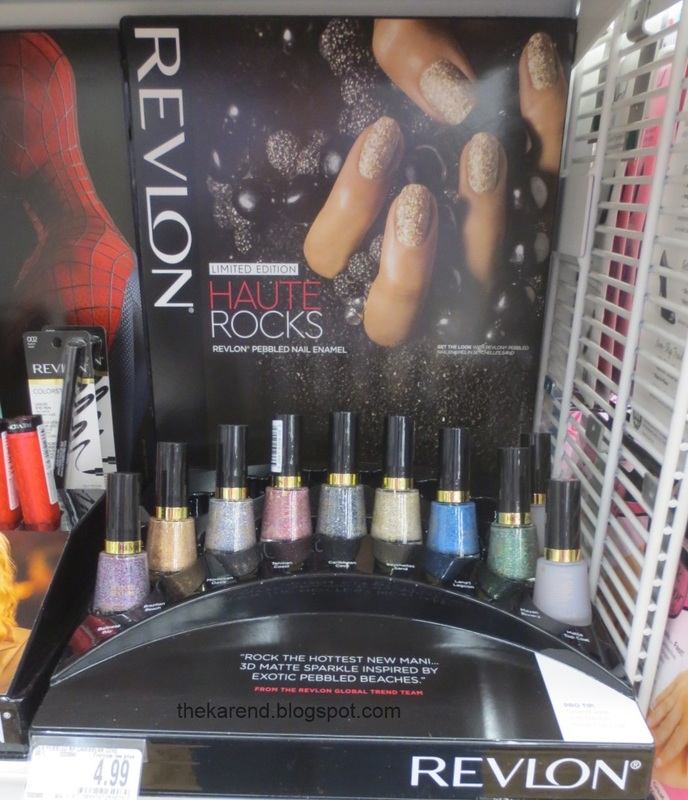 The Revlon Haute Rocks display was at Bed Bath & Beyond. The text says these polishes have "3D matte sparkle inspired by exotic pebbled beaches". There are eight shades plus Matte Top Coat here: Balinese Bay, Brazilian Beach, Moroccan Oasis, Tahitian Coast, Caribbean Cove, Seychelles Sand, Lana'i Lagoon, and Mayan Riviera. 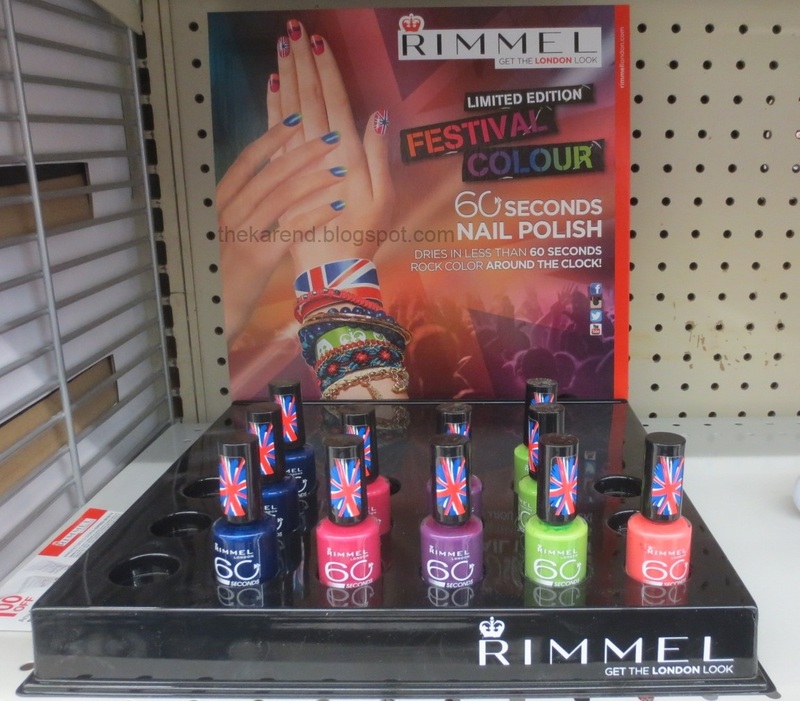 I've seen three different offerings from Rimmel since my last display post, each in a different chain of stores. 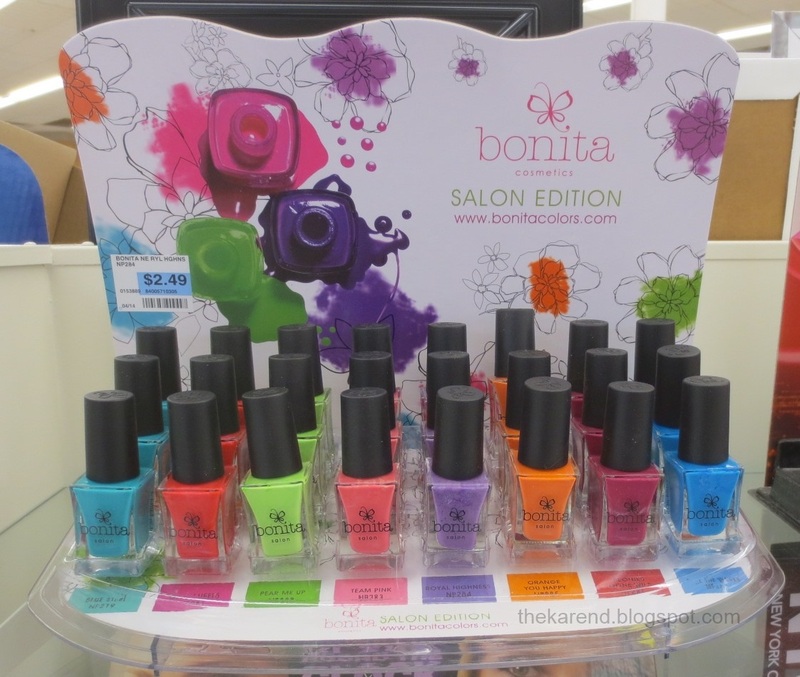 First, The Festival Colour display of 60 Seconds polishes showed up at Meijer. There were six slots, but every time I came across it, there were only five colors: Midnight Skinny Dip, Funtime Fuchsia, Purple Reign, Green Eyed Monster, and Instyle Coral. CVS had Rimmel Salon Pro, which apparently is a new line created in collaboration with Kate Moss. Some of the bottles have Kate's signature printed on them and some don't, so I guess Kate didn't wasn't into all the colors. Front row: New Romantic, Soul Session, Hip Hop, Hot Gossip, Purple Rain. Back row: Chic Chick, Barmy Blue, Simply Sizzling, Britpop, and Finishing Touch Ultra Shine Top Coat. 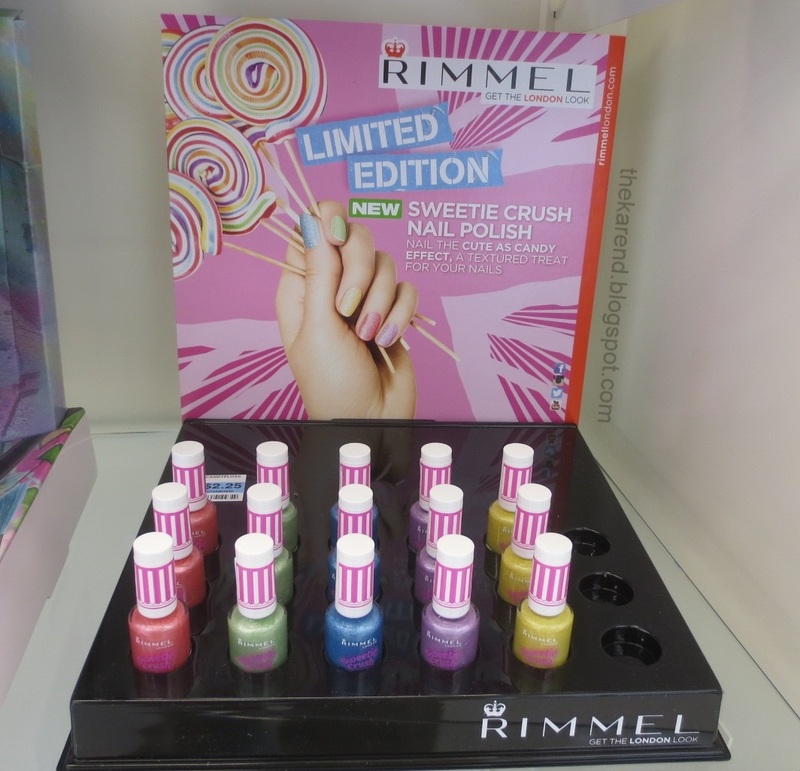 Rite Aid had Rimmel Sweetie Crush, their entry into the textured polish marketplace. Again there's the six slots and five colors setup. Shades are: Candyfloss Cutie, Fizzy Applelicious, Blueberry Whizz, Violet Swizzle, and Sherbet Sweetheart. 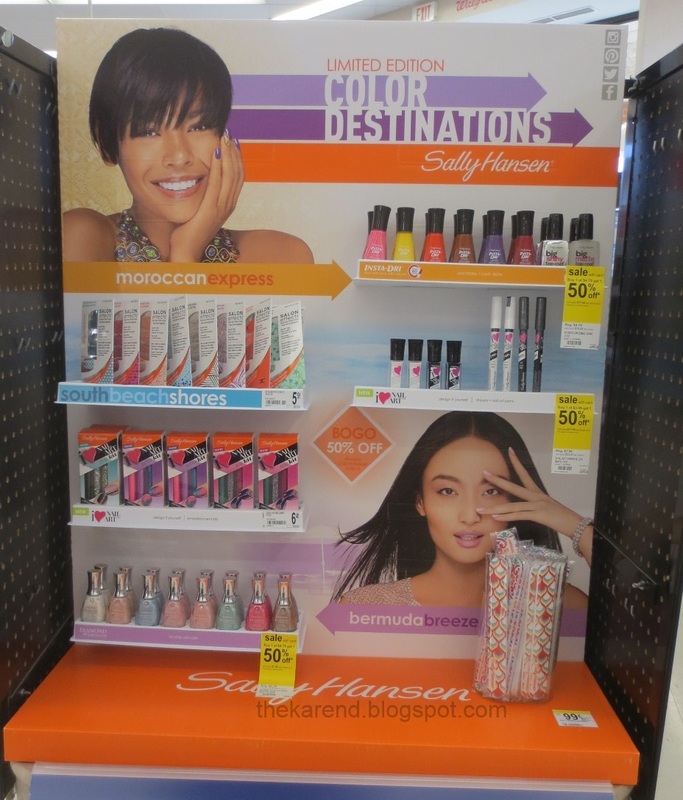 Sally Hansen has put out a ton of new stuff for spring under the themes of Color Vibrations and Color Destinations. 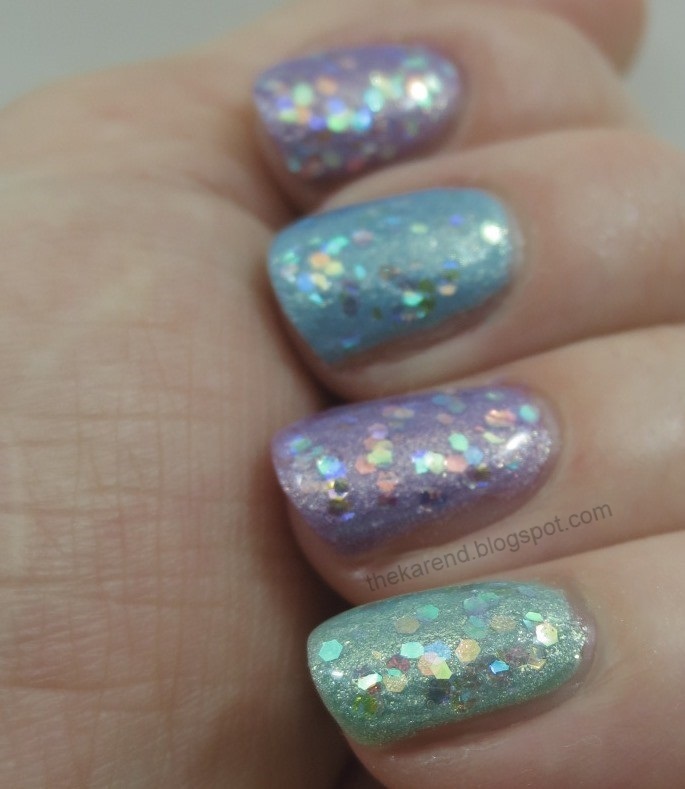 In my last display post, I shared some mostly pastel Complete Salon Manicure colors and some Xtreme Wear glitters. At that time, I'd seen the Xtreme Wear colors only in a combined endcap display with the CSM and other things. I've since spotted a standalone display with just the Xtreme Wear shades. It's called Glitter Mania and has popped up at Rite Aid. Shades here: Rock Chic, Glam Fest, Purple Petals, Rouge Rush, Galaxy Green, Indi-glow, Lightshow, and Ripple Effect. A few weeks ago, I swatched the Triple Shine Palm Beach Jellies, including a shot of the display from Meijer. The Meijer display was made from white plastic, but this past weekend, I saw a black plastic display of the jellies at a CVS. The colors in this one were arranged more to my liking, with the warm trio and cool trio grouped together. 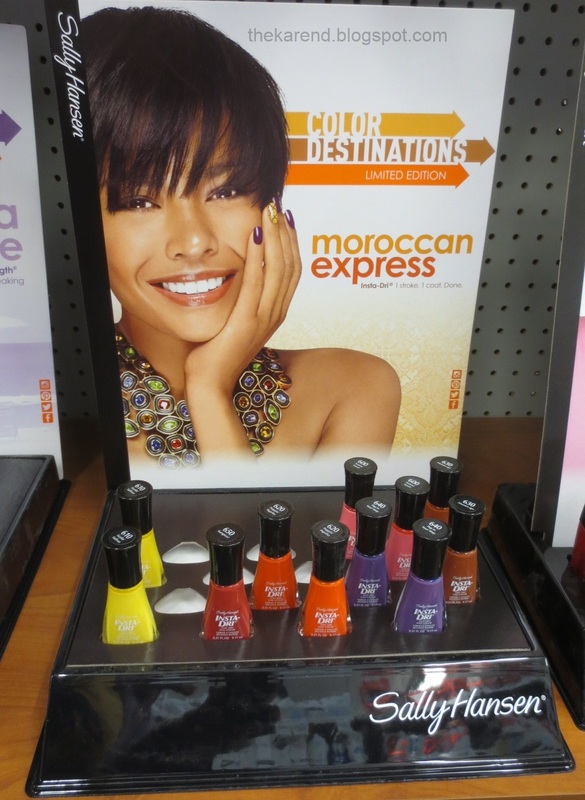 Also at CVS, I saw limited edition Sally Hansen Insta Dri colors in the Moroccan Express display: Sizzlin' Saffron, Surspice, Poppin' Paprika, Pep in Your Step, and Moracc-go. 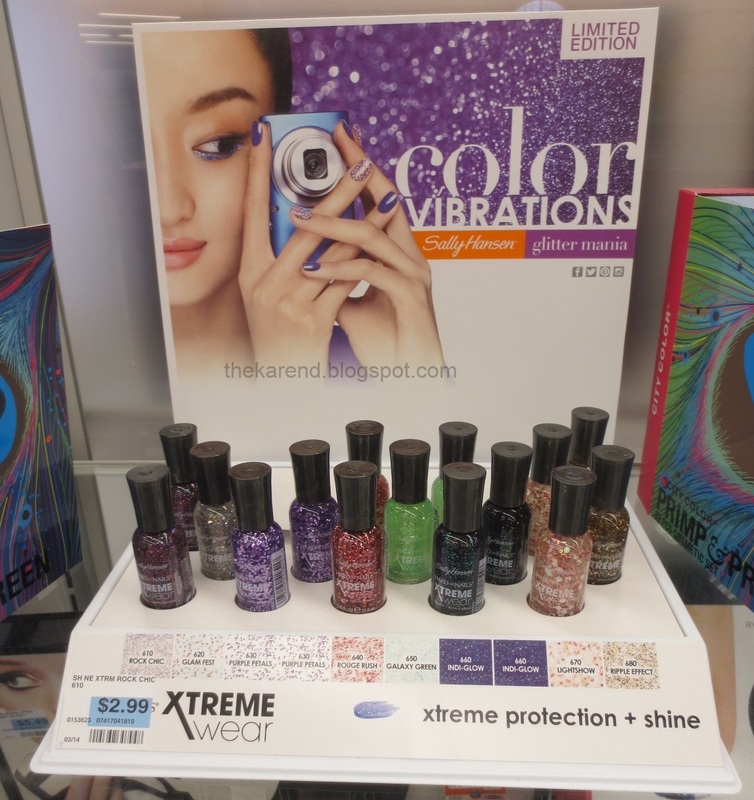 Still at CVS, there was the Bermuda Breeze collection of limited edition Diamond Strength colors: White Beaches, Hi Shineciety, Fresh Glare, Boardwalk, Sparkling Water, Shell Secrets, Gossip Pearl, and Social Sea-n. But wait, there's more. 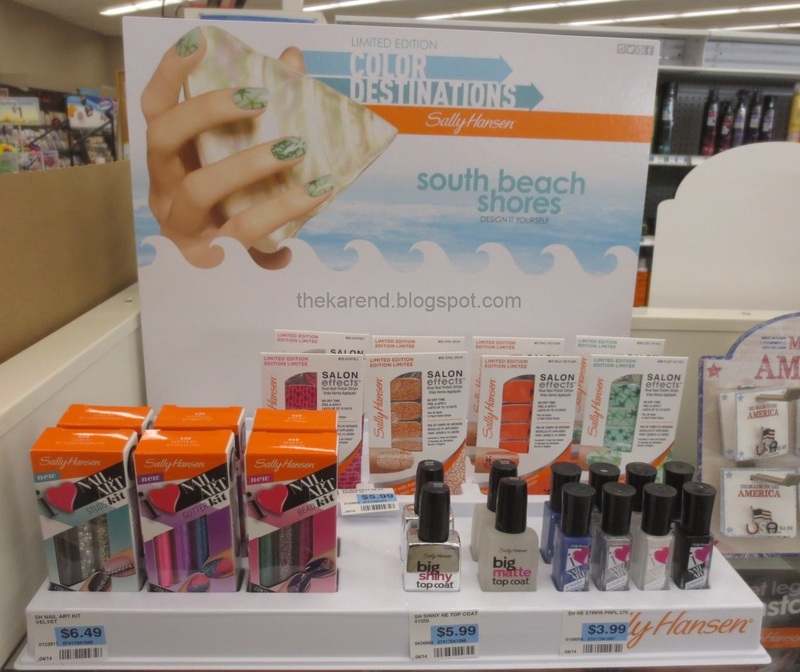 Meijer and Rite Aid had the South Beach Shores display with four Salon Effects designs (in new packaging, with fewer strips for a lower price): A Little Bubbly, Done to Scale, Sand Art and Got Gills. 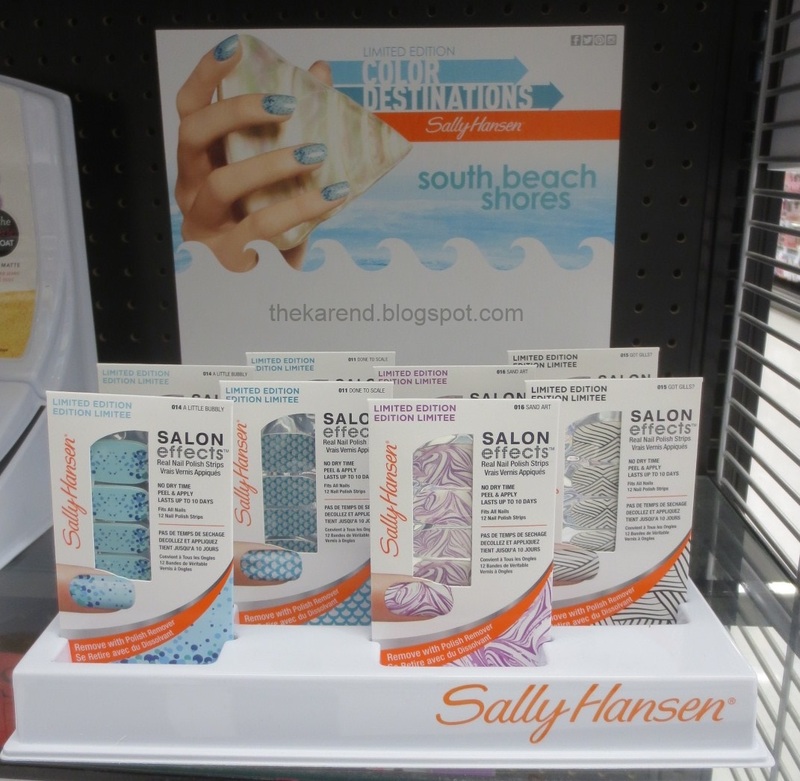 Oddly, there is another South Beach Shores display that has four different Salon Effects designs in the new packaging, along with some of the nail art stuff released earlier this year. These designs are called Adoryble, Coral Group, Walk the Plank, and Plenty of Fish. 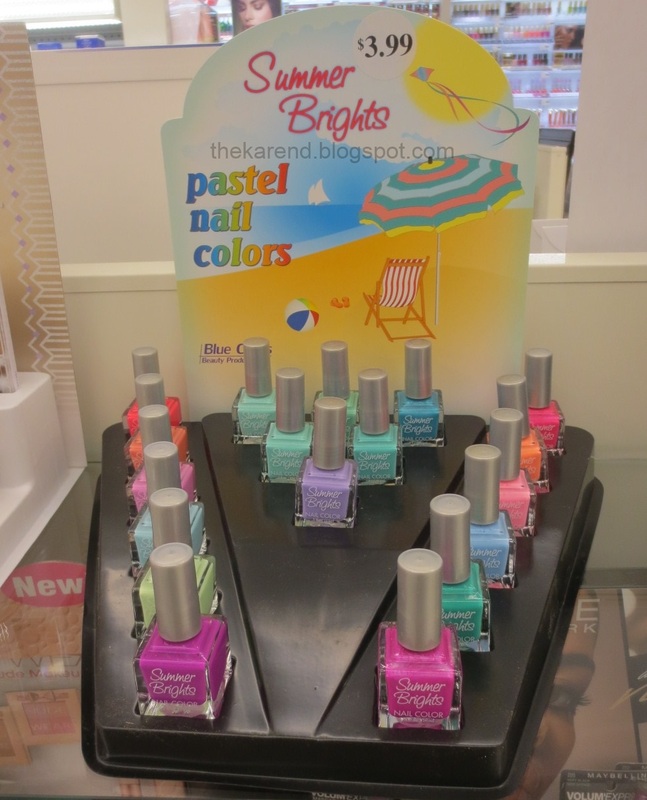 At Walgreeens, they had a Color Destinations endcap unit that had the Moroccan Express Insta Dri colors, all eight South Beach Shores Salon Effects designs, the Bermuda Breeze Diamond Strength shades, plus some nail art stuff and patterned emery boards. I didn't get to Sally Beauty in March until after I did my last display post, so I missed getting last month's Sally Girl offering up until now. Ice Cream Shoppe had four milky bases with black glitter: Mint Chip, Cherry Chip, Grape Sherbet, and Chocolate Chip. When I went to Sally Beauty this past weekend, Ice Cream Shoppe was gone. In its place was Fresh Picked, four milky bases with multi glitter: Fresh as a Daisy, So Re-leafed, Petal Pusher, and Mulberry Affair. Sinful Colors seems to be taking a bit of a break. The only new thing I've seen from them in the last month is a display at Walgreens called Mod Mod World, which mostly has stuff we've seen in other displays. The top row does have some pots of loose glitter called Shag Shakers that are new. The polish colors are mostly core or from the Oh My Mod and Mod in Bloom displays that were in my March post, but there are a handful of new colors: Bright Lights Pink City (which is orange) and On the Bright Side (yellow) in the top row of polishes and All Day and All Bright (blue) and Pink Happy Thoughts (actually pink) in the second row of polishes. Meijer had the spring Studio M collection, Pretty in Pastel. Top row: Hydrangea Kiss (x2), Blushing Rose, Blue-ming, Covered in Diamonds, Blue Valentine, Cucumber, Poetic Hues. Middle: Tru Passion (x2), Frenzy (x2), East Austin, Sweet Dreams, Wicker Park, Age of Aquarius. Bottom: Vintage Couture, Whose That Girl (x2, and why the heck they can't correct that name one of these times they repromote the color I do not know), Punked, Neon Caution (x2), and Total Wow (x2). I lacked the patience this time to figure out which are new; most are not, I know that for sure. Rite Aid had Summer Brights, another Blue Cross offering. Unlike last year, this year they're in square bottles. The color assortment is a bit different, but they still don't have shade names. 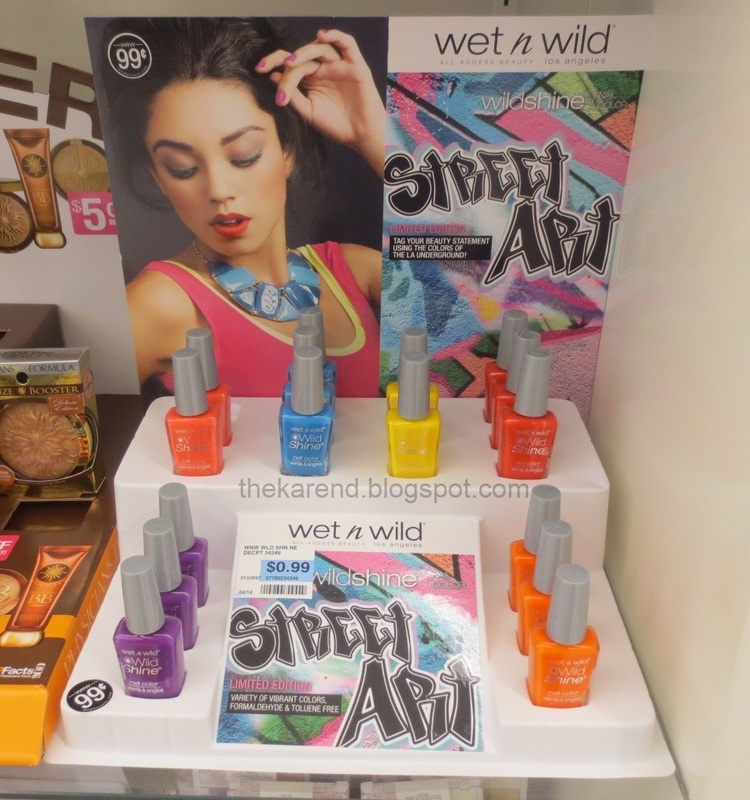 Finally, the standalone display of Wet 'n' Wild Street Art has shown up at Rite Aid. Previously, the only place I'd seen these colors was in the sidekick at Walgreens that was in my last display post. I don't know about you, but I'm feeling a bit overwhelmed. Of course that will pass and I'll be out making my rounds and hunting for new displays again before too long.